In my workplace, we have FREE food everyday. We also have a break room with good cook in the kitchen. There are so many food to choose in the display area such as salad, cake, rolls, chips, unlimited drinks in all kinds and if you want to order warm food, the cook will make it from scratch. I usually love to eat rice, sweet and sour, ham, pork spare ribs and sweet potato. Those are delicious alright but, when you eat the same type of food almost everyday (for months), your taste buds will complain. 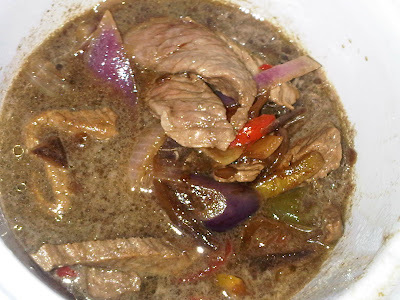 During my day off, I would pamper myself with Filipino Foods such as this beef stew with Datu Puti Soy Sauce in it. 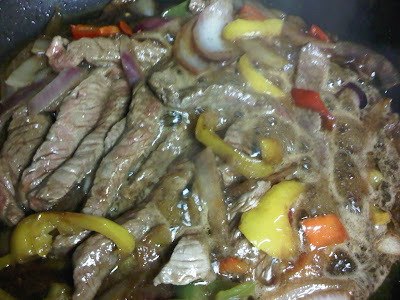 The picture above is my finish product but, I let it sit in the crock pot after using the frying pan.. I chose the red meat but it was lean so it was not tough to eat. 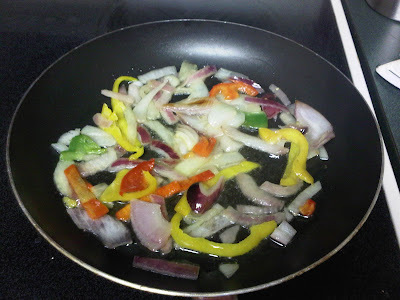 I have pre-chopped onions, bell pepper with colors green, yellow and red. I am not a cook but, i tried to cook the food that I missed so much. How Do You Get Rid of Annoying Person?